Can Mo Farah take the win in this year's London Marathon? The surge of the adrenaline, the smell of the vaseline, the shine of the silver foil blanket. It must be London Marathon time! 26.2 gruelling miles around the streets of the United Kingdom's capital city, it's one of the world's most famous long-distance road races. No gold medals for guessing where the London Marathon is being held - the world famous race takes in an exhausting 26 miles and 385 yards (that's roughly 42.2km in new money) of the UK's most famous streets and landmarks. The start times are staggered over the course of the day, Sunday April 28, with the wheelchair races, para athletes and Elite Women's Race already underway. The Elite Men's Race (featuring Mo Farah) and Mass Race get started at 10.10am BST, 5.10am ET, 2.10am PT. And the 2019 edition is likely to be one of the most watched in recent years, thanks to the presence of one Sir Mo Farah. You won't want to miss out on a London Marathon live stream. Yep, Mo's back again. But with the fastest marathon time of 2hrs 1mins 39secs set by Kenyan Eliud Kipchoge in Berlin last year, he's the one to watch. Will it be misery or the Mobot? Either way, TechRadar will tell you how to live stream all the Marathon action. But the London Marathon isn't just about the so-called elite runners. It's the fun runners, wheelchair athletes and plethora of weird and wacky fancy-dress costumes that make the event so iconic. Around 40,000 people will be running today, the vast majority fulfilling long held dreams. And the great news is that getting a live stream of the 2019 London Marathon is really easy, as the BBC has the rights to show it in all its glory - just as it has since the inaugural year in 1981. 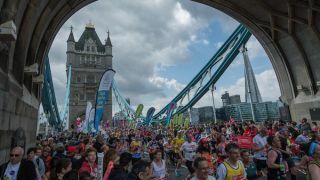 And even if you live outside the UK keep reading as we’ll show you how to live stream the London Marathon 2019 from wherever you are in the world. The BBC goes all out with its coverage of the national treasure that is the London Marathon. So if you're in the UK and you have a TV license, then you can catch it on BBC Two from 8.30am then switch to BBC One from 10am all the way until 2pm as the last of the fun runners stumble past the finish line. Then it's back to BBC Two from 2pm until 2.30pm if you're still eager to watch more. If you're not in front of a television, then the iPlayer or BBC Sport app is the way to go for uninterrupted action and your pick of what to watch. The other way to watch the BBC online is to go via TVPlayer.com, which doesn't require any sign ins and hosts all of the UK's free-to-air channels without having to worry about hopping around from site to site or app to app. If you’re in the US and want to watch this year’s London Marathon, then you’re in luck as you have several ways to watch the event. NBC Sports will air all the action on the day with the Elite Men's race starting from 5.10am ET, 2.10am PT. If you’d prefer to stream the London Marathon on your computer, streaming devices or on mobile, the NBC site and NBC Sports App will also be streaming the event. If you want more athletics for your buck and plan on tuning into the Diamond League as well as the rest of the IAAF Championships, NBC Sports Gold also offers a Track and Field Pass for $74.99 a year. The service lets you stream all of the top marathons and other athletic events without commercial interruptions and if you happen to miss an event, you can always watch it later on-demand. Simply open the VPN app, hit 'choose location' and select the appropriate location - it's super easy to do. Choose UK to stream the London Marathon 2019: (use the links below). The TVPlayer service is a free, legal way to stream every yard of this year's London Marathon live. Among the channels on offer is BBC One which will show the entire event, as well as a highlight show on BBC Two at 6pm BST (1pm ET, 10am PT). And if you'd prefer to watch the Marathon in your own time, TVPlayer will also allow you to do that too. You'll need to sign up for a paid account, but the good news there is that the site offers a 14-day free trial so no payment is required.